The term 'Bali Beads' arose because this style of beads was originally only handcrafted in Bali, Indonesia. Due to their individually handcrafted nature, they are fairly pricey. Hence, the price factor gave rise to 'Bali-style' beads which are generally from India or China and are very much more affordable for the general public. Offering an elegant & inexpensive medium, metal beads from copper & brass are used to manufacture a dizzying array of styles and looks while maintaining a rustic, ethnic charm. 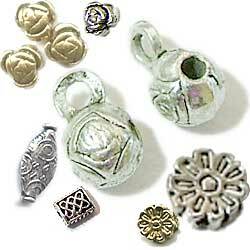 Both are often quite ornate and are often used with crystal beads to create exotic & original jewellery creations. They are extremely popular with all age groups.